Working in a clothes shop can leave your hands feeling really dry! The size cubes you put on the hangers chip away at your skin until you're left with little marks and cuts. I knew I wanted to get my person a moisturising hand cream, and I've heard great things about The Body Shop's hand products. The one I decided on was Wild Rose Hand Cream in SPF 15. It smells amazing and is designed for mature skin, which is perfect as she's in her 50s. It costs £5 usually but I got it in a set with a nail file. The next gift is the Born Lippy Pot Lip Balm in Passionberry. It was only £2 but I thought it might be nice to keep in her bag/pocket or to give to her daughter. It has a slight purple tint apparently but the reviews say otherwise! What gifts are you getting as Secret Santa? Let me know in the comments! 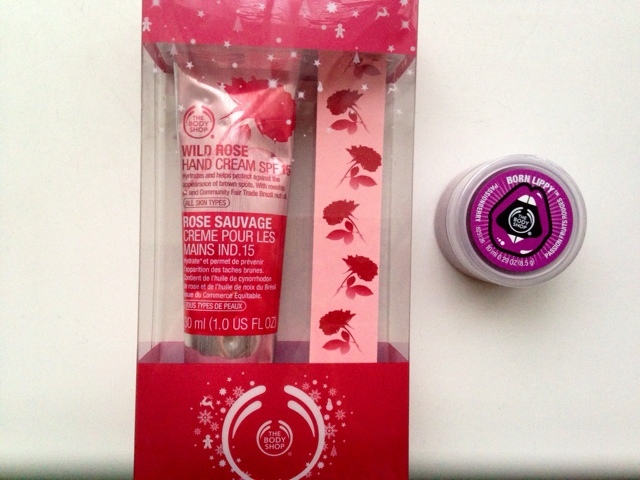 I was eyeing up that Body Shop hand cream set when I was out shopping for Christmas presents myself the other week - it looks a really handy set.